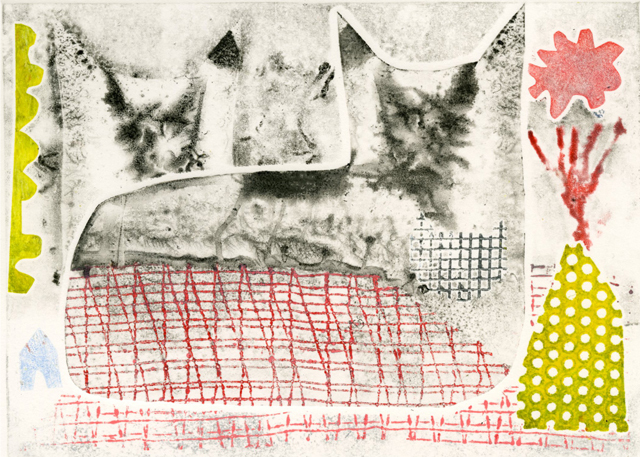 This original monotype entitled ‘Pet Me’ is included in the Synergies: New Artists Expo. 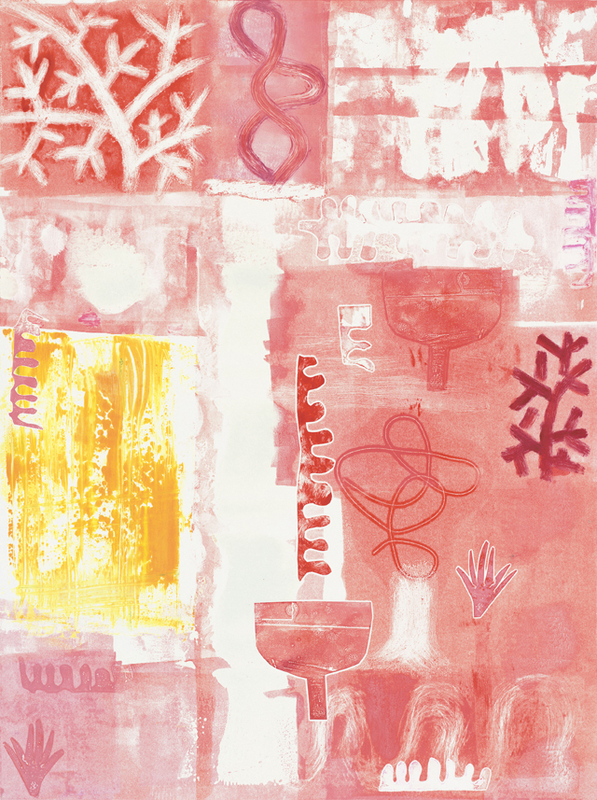 Recently I’ve been working a series of monotypes that will be included in the Synergies: New Gallery Artists Expo that opens on January 10th and runs thru February 9th, 2014. Eight of my pieces are included in this exhibit that features five new Gallery Artists in the Dillon Gallery at the South Shore Art Center in Cohasset, MA. This exhibit runs in conjunction with the ‘Made in America’ Gallery Artists Juried Exhibit in the Bancroft Gallery. ‘Red Sea’ original monotype included in Synergies Exhibit. The series is a recent snapshot of my interest in the natural beauty of color, texture, scale and spontaneity. 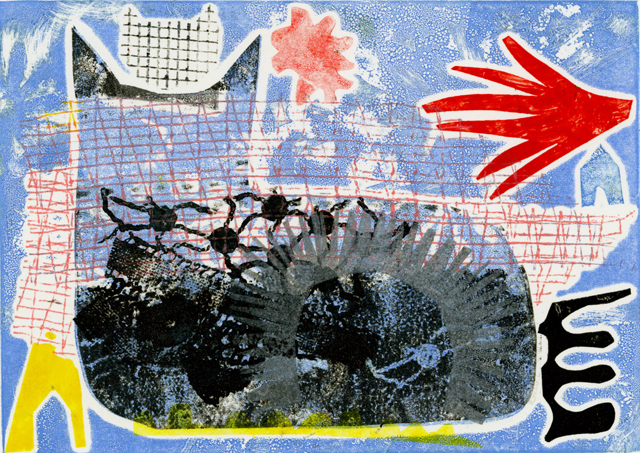 Each print is unique and one-of-a-kind, which is inherent in monotype printmaking. The process begins by choosing a plexiglass plate whereby mediums are applied, built up, and then removed until the image is to my liking. My interest in working with inks, and how they can be manipulated, is fascinating and challenging both creatively and technically. I also create templates made from various materials ranging from plastic cutting boards to pieces of fabric and found materials that impart texture into the print. While working, I may have a story in mind. Sometimes it evolves as I work with the materials, similar to a musician that warms up to find a groove, thereby creating the unexpected while following the intuition of the moment. 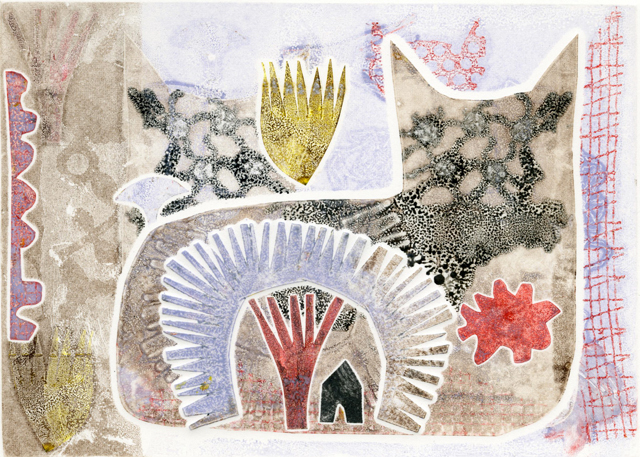 Original monotype entitled ‘Kitty Come Home’ is included in the Synergies: New Gallery Artists Expo. Abstract ideas are incorporated with a touch of realism—ancient forms fused with modernism. Scale is another aspect of my work that intrigues me. In this series there are larger pieces along with smaller ones. Within the compositions there are elements that are both large and small creating altered perspectives. Once I am satisfied with the composition a sheet of Arches 88 paper is placed over the plate and is run through a hand press. The pressure from the roller transfers the image onto the paper. The monotype process allows for a looseness with unexpected results that add character and unusual details to the finished print. The final pieces give enough information to bring the viewer to the threshold of their own interpretations. This monotype entitled ‘Twins’ is included in the exhibit. Please visit this exhibit that has it’s opening reception on January 10th from 6 to 8 pm. The South Shore Art Center operates Monday–Saturday 10–4, Sunday 12–4. You are currently reading Synergies: New Gallery Artists Expo at donna ingemanson studio.